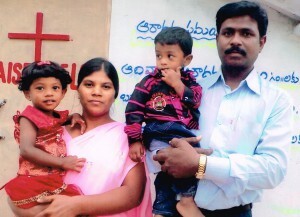 Biography: After 8 years as a missionary, Karunakar became a pastor in 2011. Sharing the love of Jesus throughout the remote areas of Asia spearheaded his passion to give materially, as well as spiritually to others. While surrounded by idol worship, the Good Samaritan church in stark contrast, illustrates its name by giving to those less fortunate. They are especially compassionate toward the elderly and walk out their Christian convictions through supplying food and clothing to those in need. Strengths: Karunakar is gifted in preaching, evangelism and administration. Usha strengths are singing, writing songs and teaching Sunday school.